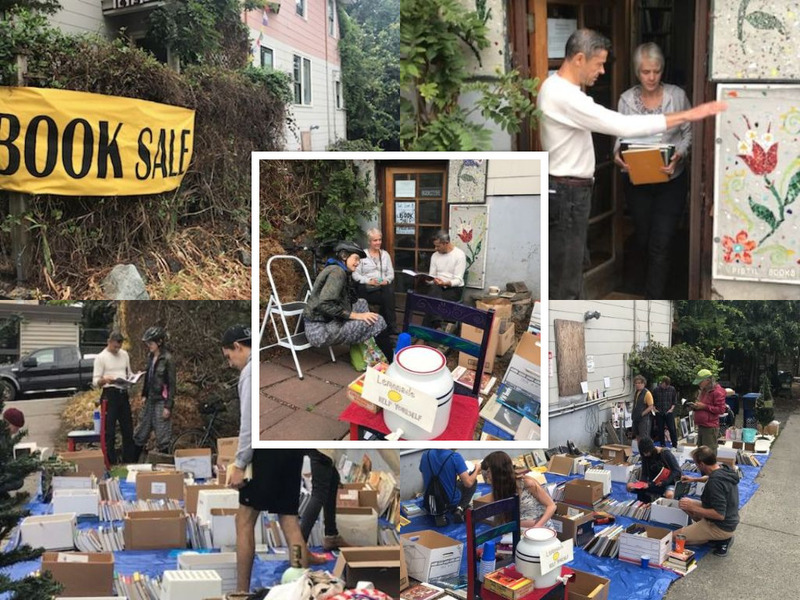 On Saturday we held our annual outdoor yard sale/book sale. I scheduled it a month ago when Seattle was experiencing heat in the 90's combined with smoke from wildfires and didn't expect that I would be worried about rain in the first week of September. Saturday was gray and cloudy and I felt a couple of raindrops fall, but luckily we made it through the day without showers. We had a steady stream of browsers and customers the whole day. People were sitting on stools and cushions reading, chatting, and drinking lemonade. We were visited by a mix of people who knew about Pistil and had been to our annual sale before and those who had never heard of us. 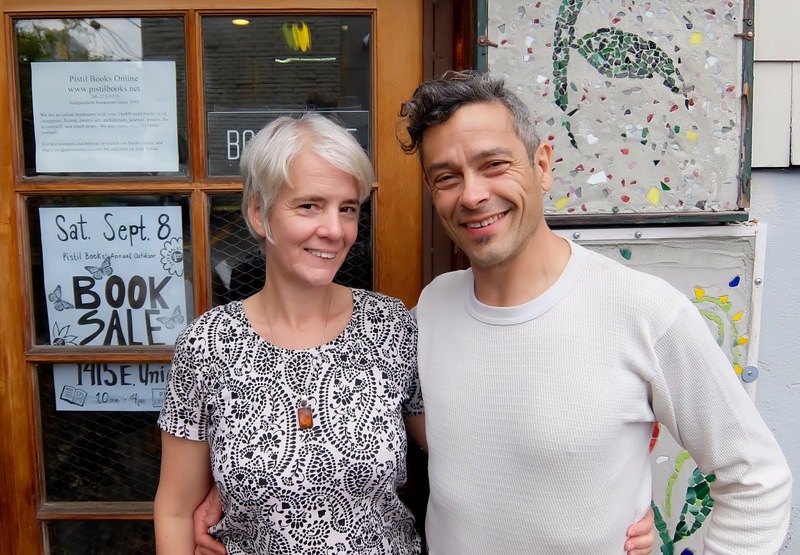 They found out about the book sale from our email announcement, telephone pole posters, Craigslist ad, and plugs from The Stranger, Seattle Review of Books, and SeattleMet listings. Jon Strongbow came by, as he does every year, and presented us with a copy of his spiral bound book-in-progress, Visonary Surrealism at the Pike Place Market. It is thick and full of color images of artwork. Jon even mentioned Sean and I as Seattle collage artists, though since we aren't part of Pike Place Market, our work wasn't included. He left the book sale with a cloth bag of books precariously hanging from his bicycle handlebars. Our neighbor Eletha--who used to shelve books in our retail store in exchange for book credit-- came by to show us her sketch book full of beautiful color pencil drawings she made based on images of animals and bugs from volumes of the Golden Book Encyclopedia she had found at our free pole. She left the book sale with a set of laminated illlustrated pamphlets depicting the insects of Britain. Our friend Marin arrived to cut down a damaged branch from a tree on his neighboring property that was hanging down over the sidewalk. 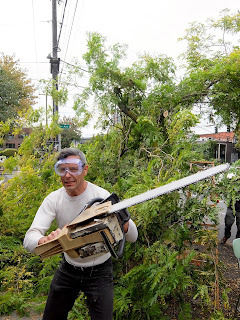 When Sean saw him with his small chainsaw, his chainsaw competiveness reared up and he went and got his bigger chainsaw (for use on his rural property, not normally something that comes in handy on Capitol Hill). Not every book sale has timber felling. Greg B., a local English teacher and longtime Pistil supporter captured the event on film. 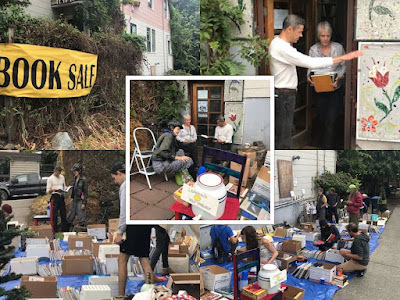 At the stroke of 4pm, the advertised end of the sale, all the browsers vanished and we immediately packed up, boxes of books going into the back of the Pathfinder for distribution to Little Free Libraries. Thank you to Kam and Michael J. for helping us set up and shut down.